With a powerful Honda engine, the Husqvarna HU800H starts easily with a single pull and runs smoothly. Best suited to medium to large lawns, its speed controls are on the handles; a drawback is that you have to hold them down the entire time, which can quickly tire the forearms. The mower has good traction on hills, and its double ball-bearings provide good maneuverability. 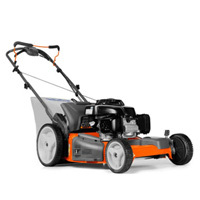 With solid construction, including the heavy deck and large bag, the Husqvarna HU800H is reasonably priced at $459.99.